Rheumatoid arthritis (RA) is a chronic autoimmune disease that causes pain, swelling, stiffness, and loss of function in the joints. Rheumatoid arthritis occurs when a person’s immune system mistakenly attacks the healthy tissue that normally protects the body from outside harm, such as bacteria and viruses. Because permanent damage to the bone can begin in the first year of developing the disease, early diagnosis and treatment are important to slow down the progression. About 1.5 million people in the United States have rheumatoid arthritis. RA often begins in middle age and affects nearly three times as many women as men. It does not usually occur in children and young adults, but a related disease called juvenile idiopathic arthritis (JIA) or juvenile rheumatoid arthritis (JRA) can sometimes develop. RA is a disease that generally progresses slowly, but the damage cannot be reversed once it occurs. Cartilage is the elastic tissue that covers the ends of the bones. This cartilage supports the joints and helps protect them during movement. Next to the cartilage lies the synovial tissue, which creates synovial fluid to lubricate and nourish the cartilage. In rheumatoid arthritis patients, the synovium in specific joints becomes inflamed, leading to tissue swelling and painful movement of the affected joints. The inflammation can also lead to joint erosion, loss of movement, and joint damage in multiple related body parts. Put more simply, a person with RA will no doubt experience progressively worse pain and stiffness, particularly if it isn’t treated with non-steroidal anti-inflammatory medications or other appropriate treatment. A person may be born with certain genes that make it more likely to develop rheumatoid arthritis. An infectious agent, such as a bacteria or virus, may cause RA in a person who is more susceptible due to genetics. RA is more prevalent in women, with female hormones possibly having an effect on it. Also, persons 40-60 years of age (and sometimes teens), and individuals with a family history of RA have a higher chance of developing the disease. The symptoms of RA can begin slowly and are often inconspicuous and nonspecific, which can make it more difficult to diagnose. Early symptoms or RA, such as fatigue, stiffness, and joint tenderness, can look like other less severe conditions. 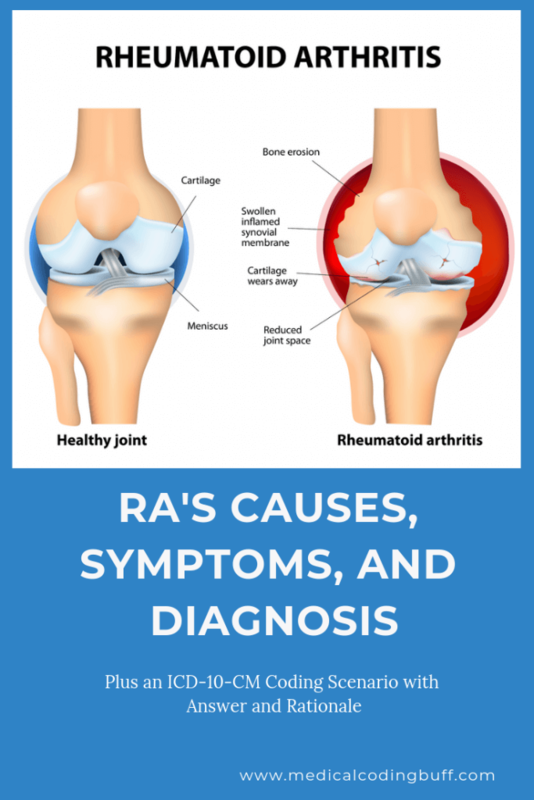 Furthermore, some cases of RA present with different symptoms than present in other cases, and many of these cases can go for a long period of time without showing any symptoms. Swelling: Synovial tissue in the caps of joints become damaged in RA individuals, leading to thickening and swelling of the tissue. Stiffness: Inflamed joints are prone to stiffness and have trouble moving. RA sufferers experience stiff joints, particularly in the mornings or after long periods of inactivity. This stiffness and loss of function can last for hours. Pain: Intense pain and joint damage can result when the cartilage and bone in the joints wear down. In RA sufferers, the joints surrounding the muscles, ligaments, and tendons tend to weaken and no longer support the joints. Redness: When the joints become mildly or heavily inflamed, they may become warm and look pink or even red on the outside. When the smaller joints are damaged by RA, the damage often then spreads to the major body joints. And a person who suffers from RA may experience heavy inflammation of the joints for several months at a time. Physical symptoms of RA due to extreme inflammation can affect the entire body and may appear similar to the flu. The difference is that the symptoms caused by extreme inflammation and RA are chronic and can be long-lasting. Rheumatoid nodules that develop under the skin over bony areas that have been eroded away. Only about 20 percent of RA patients develop these nodules. A person with RA may also have to deal with emotional symptoms. For instance, a person who suffers from RA may have to go long periods of time without the ability to function and may have to endure much pain. This can be quite difficult, especially if it affects the person in the workplace. Because these struggles are common amongst those with RA, this is another reason why early diagnosis and treatment is crucial. Medical History and Physical Examination: The specialist will discuss with the patient the personal and family medical history, current and recent symptoms, and examine the patient’s joint(s) for any tenderness, swelling, warmth or painful or restricted movement. Since RA tends to affect joints on both sides of the body, both sides will be examined. There may be other signs of RA revealed in the examination, such as rheumatoid nodules or a low-grade fever. If the symptoms that have been present for longer than six consecutive weeks, the physician may determine them to be specific to RA, as opposed to another type of arthritis, including osteoarthritis. Rheumatoid factor (RF) – a type of antibody found in most RA patients. If RF is present in the blood, there is an 80 percent chance of developing RA or another inflammatory disease. Imaging: To look for joint damage, an x-ray, ultrasound, or magnetic resonance imaging (MRI) scan may be performed. There may be a loss of bone within the joint, bone and cartilage erosion, or narrowing of the joint space, which could be signs of RA. If there is no joint damage viewed on the imaging tests, RA may still exist but be in an early state where damage has not yet occurred in the joints. Once a combination of tests have been performed and a diagnosis of RA is made, an appropriate treatment plan will be created. According to Rheumatoid Arthritis Support Network, researchers are continuing to determine new ways to classify the types and subtypes of RA based on the symptoms each patient experiences, along with other factors. Due to the progressiveness of the disease, patients may be found to have many types or sub-types throughout the course of their lives. Currently, physicians determine the diagnosis of RA based on symptoms, blood antibody, and lab tests, as well as x-rays. However, this is just the beginning, as researchers anticipate being able to further fine tune the diagnosis and identify the type and sub-type of RA down to the molecular level. This will result in a better understanding of the disease and how to improve its treatment. At this point, the two main types of RA are seropositive RA and seronegative RA, with the third type being juvenile rheumatoid arthritis (JRA). Blood tests show the presence of anti-cyclic citrullinated peptides (anti-CCPs), otherwise known as anti-citrullinated protein antibodies (ACPAs). Approximately 60 to 80 percent of RA diagnoses have the seropositive type, and clinical symptoms may not be seen for 5 to 10 years after the antibodies appear. Patients with symptoms of RA and a positive blood test for the antibody almost always receive a diagnosis of RA. Blood tests show no presence of antibodies in the blood. The chances are higher of having RA if the patient is seropositive, but a seronegative blood test can also meet the criteria of RA. Individuals with seropositive RA, or who are anti-CCP positive, have a common sequence of amino acids referred to as the shared epitope. For unknown reasons, the amino acid sequence contributes to RA. However, the thought is that it attaches to citrullinated peptides and that plays a part in producing anti-CCP antibodies. Cigarette smoking is strongly associated with the development of RA in individuals with the shared epitope. In fact, scientists believe that smoking leads to inflammation in the lung, and this inflammation results in protein citrullination that then induces anti-CCP antibodies in people who are genetically susceptible and have the shared epitope. Juvenile rheumatoid arthritis (JRA), otherwise known as juvenile idiopathy arthritis (JIA), occurs in patients under 17 years of age and is the most common type of arthritis in this age group. Patients with JRA may experience growth problems due to the disease, including eye and lymph node inflammation concerns. Similar to RA in adults, different blood tests are performed to determine rheumatoid factor and the presence of anti-CCPs. There are cases where the physician is unable to detect abnormalities in the blood tests in juveniles who have clinical symptoms. X-rays and CT scans are also performed to determine any other medical problems such as bone fractures, infections, and tumors. Rheumatoid arthritis can be confused with osteoarthritis, particularly in the seronegative type of RA. However, osteoarthritis is not an autoimmune disease, but rather a condition caused by joint wear and tear. According to the ICD-10-CM Official Guidelines for Coding and Reporting, diagnosis codes for rheumatoid arthritis are located in Chapter 13: Diseases of the Musculoskeletal System and Connective Tissue (M00-M99). Most of the medical codes in this chapter are classified by site and laterality and represent the bone, joint, or muscle involved. The sites include shoulder, elbow, wrist, hand, hip, knee, ankle and foot, multiple sites, vertebrae, and unspecified. In situations where more than one site is involved and no “multiple sites” code is provided, more than one code is needed to indicate the different sites involved. There may also be a code to designate with or without rheumatoid factor and with or without organ or systems involvement. Furthermore, there are no bilateral codes, so a code should be assigned for each side when both sides are involved. A patient presents to the rheumatologist’s office with rheumatoid arthritis of multiple sites with associated polyneuropathy. Assign the ICD-10-CM code. Polyneuropathy is a disease in which many nerves in different parts of the body are damaged. It is a common manifestation of RA and other autoimmune diseases, and it affects the peripheral nerves and the central nervous system, according to the National Insitute of Neurological Disorders and Stroke. In order to determine the correct ICD-10-CM code for rheumatoid arthritis, the coder needs to know that this condition is joint specific and may also affect the entire body, including the heart and lungs. The documentation should provide the type of arthritis (juvenile, seropositive, seronegative), and any associated manifestation such as myopathy, heart, or lung involvement. A combination code is assigned for the type and site of rheumatoid arthritis and the manifestation. To find the correct code for this coding scenario, look in the ICD-10-CM coding manual under Rheumatoid, arthritis, polyneuropathy, multiple sites. It refers us to M05.59. Verified in the Tabular, M05.59 describes Rheumatoid polyneuropathy with rheumatoid arthritis of multiple sites. Remember to read all the notes before selecting the appropriate code and make sure the documentation supports the assigned code(s). Hi Akhil. First of all, I apologize for the delay in my response. For some reason, your comment ended up in my Spam folder. Anyway, I’m so glad you found the article informative, and I hope you will be sure to check out my other articles.